Head shots of some of the Giraffes at the Yorkshire Wildlife Park. Yet more images from the Yorkshire Wildlife Park. This time three shots of Giraffes. As yesterday, more shots from my Chester Zoo archive. 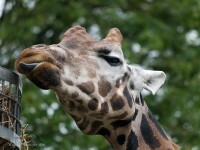 Six photos of some of the Giraffes at Paignton Zoo, shot during our visit in September. Three shots taken at the Yorkshire Wildlife Park.